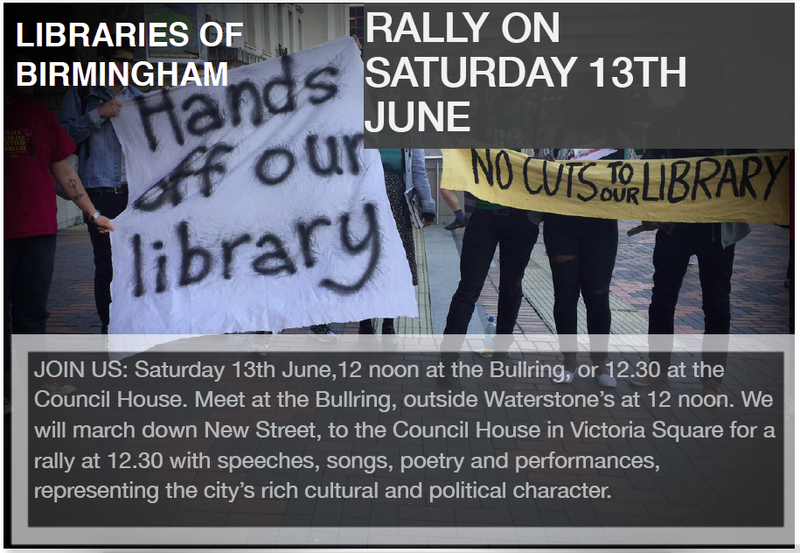 Join us to show the politicians that we reject the savage cuts to the libraries of Birmingham! Austerity cuts to our public services attack our access to public education, communal space, and the city’s collective memory. Birmingham City Council have said that “there is no alternative”. Yet, millions of pounds are poured into the city’s commercial district, athletics matches and other pet projects. Less than two years after opening, the £188m Library of Birmingham has become the city’s white elephant and the 38 community libraries are under equal threat. Every day, queues of disappointed citizens – of all ages, all ethnicities, employed and unemployed – mark the loss caused by the cuts to staff, opening hours, and outreach work. Like the rest of the national austerity agenda, library cuts are ideologically inspired, and will affect the poorest the most. We cannot stand for this. It is not good enough for the people of Birmingham. WHAT IS HAPPENING TO THE LIBRARY OF BIRMINGHAM? WHAT IS PROPOSED FOR BIRMINGHAM’S COMMUNITY LIBRARIES? JOIN US: Saturday 13th June,12 noon at the Bullring, or 12.30 at the Council House. Meet at the Bullring, outside Waterstones at 12 noon. We will march down New Street, to the Council House in Victoria Square for a rally at 12.30 with speeches, songs, poetry and performances, representing the city’s rich cultural and political character. Invest in our city & our futures – REVERSE your proposed cuts to the Library of Birmingham & our Community Libraries.